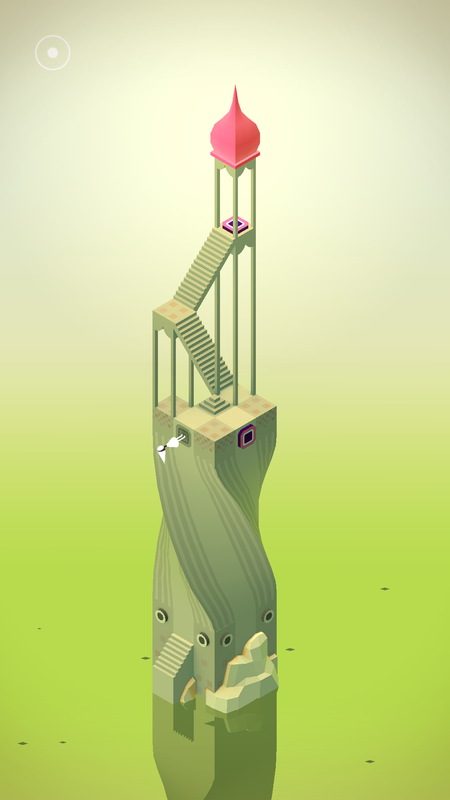 Monument Valley is a puzzle game for iOS & Android, in which you help a princess explore strange monuments left by her people, restoring them to power. I first heard about this game during this year’s BAFTAs, where they nominated it in pretty much every category. It won the Best British Game and Mobile & Handheld awards. Once I finished watching the awards, I decided to buy the game on the Google Play Store and I even got the expansion pack. As this is a mobile game, you control everything through taps and swipes. You tap on the screen to where you want the princess to move and you swipe to interact with the environment. There are cranks to turn, and segments of the environment with small stubs on them that you can move horizontally, vertically or even rotate the stage, to help the princess move along the monuments. Each level ends when you approach a certain tile and the character places an increasingly intricate geometrical piece on it, the Sacred Geometry, which is central to the plot, which I won’t comment on due to its simplicity. Anything I say will ruin it for you. Some stages shift around and rotate, showing new rooms and puzzles. The mechanics are simple but the stages will take some trial and error as you learn to properly navigate them and make use of the different movable pieces. I’m certain one of the inspirations for this game were the works of M.C. Escher, as you have to take perspective into consideration. For example, something that is far away can be an adjacent platform if you turn the camera in a particular way. Perspective is central to many of the Monuments. There is one in particular where a door takes you to another one, placed in a different perspective so that now you’re walking on what you thought was a vertical wall. At certain times I had to turn my mobile around just to see things from the character’s new point of view. It was these moments, when the game took perception into consideration, where it truly shined for me and left me awed. The Forgotten Shores expansion adds new levels and different mechanics, such as these twisty corridors. 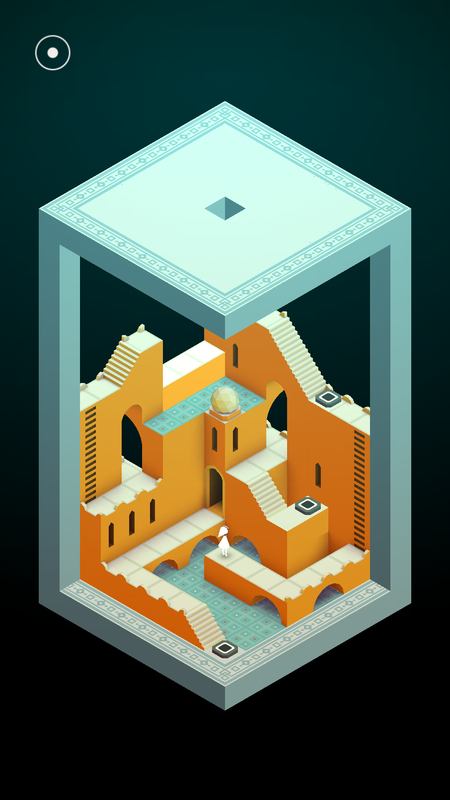 It’s difficult to talk about Monument Valley’s sound as a separate thing to gameplay. There is a soundtrack and the music is beautiful and ranges from subtle soothing melodies to haunting ones and even some upbeat adventure-y tunes, but also every stage is essentially a giant music box and interacting with them generates its own music, from pulling cranks to pressing a button that shifts the entire stage around. It’s almost as if by playing, you’re composing the stage’s music. It didn’t matter what level it was, this always made me smile. I do wish the stages were longer. This is a game, like many mobile ones, meant for short play bursts and as such, the different monuments take at most ten minutes to complete. The Lost Shore—the 8 level expansion—has longer levels but still not long enough. It doesn’t detract from the marvellous experience, but it did leave me wanting more. Some of the later stages get complicated but as an experienced adventure gamer used to intricate puzzles, I felt as though the game could’ve given me much more than it did. The visuals are minimalistic but gorgeous. Each monument is a work of art—if I could I would frame and hang them on my wall—that would make M.C. Escher blush, and it’s a joy to watch these music puzzle boxes change and move around to reveal new rooms and alcoves. The developers at ustwo must’ve known this because they added a camera mode for you to turn the world around however you want for screenshots. They even built in some of the more popular Instagram filters. Monument Valley is a wonderful game, one of the best mobile games I’ve ever played and while I do wish there was much more and a higher difficulty, what is there is breathtaking and you should all play the game right now!